Villa Gregory is a beautiful luxurious five bedroom villa which sleeps up to 10 people. It offers a private pool, panoramic views of the mountains and sea, as well as wifi internet access. 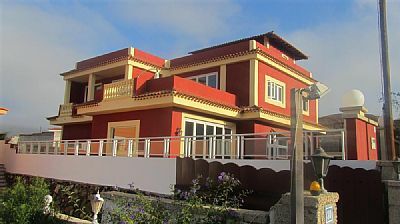 The villa is situated in a quiet location between Benitez and Buzanada in Arona. The villa enjoys superb panoramic views of Cabo Blanco, El Tiede and the sea. It only takes 8 minutes by car to drive to Los Cristianos and Las Americas, or 10 minutes to El Medano beach. So guests have the best of both worlds: peace and quiet at the villa, or the hustle and bustle of the busier resorts. The living space inside the villa is laid out in an open plan style and is very spacious, 330 metres squared, consisting of a kitchen/dining area and seating area. high 3 metre ceilings, wifi internet access with many access points all over the villa, which means you can get the internet regardless of where you are outside or inside the villa. All the bedrooms have their own private balcony, apart from one and lots of storage space in the fitted wardrobes. This room has a sea view through the 4 metres of bi-folding glass doors. There are many toys provided here for children to play with. There are 3 living rooms in the villa. The TV Room is just off the main lounge, 2 x chaise longs, large leather sofa, 50" internet TV with an XBMC streaming box attached, which provides an enormous selection of movies to watch.